In February, Joletta took part in the Living with Pain panel at the San Diego Pain Summit. She has been to all four San Diego Pain Summits thus far and is honored to contribute to such an important annual summit. In addition to being a panelist in 2018, she was also a patient demo for Peter O’Sullivan, pain researcher and physical therapist, in 2017 (she wrote up that experience here). In April, Joletta was invited to speak and lead breakout sessions at the Montana Pain Conference to represent the patient perspective. She co-presented with pain physician Dr. Chris Caldwell, kicking off the conference with Teaching Pain Science into the Patient Narrative. It was a truly interdisciplinary audience of MDs, DOs, PharmDs, PsyDs, nurses, physical therapists, movement professionals, behavioral health counselors, and other allied health pros. To continue on joint presentation’s theme, Joletta also led breakout sessions each day on the patient perspective. She spoke about why and how pain science is valuable in pain treatment and how pain science can inform empowered paths forward for people living with pain (and the clinicians who treat them). 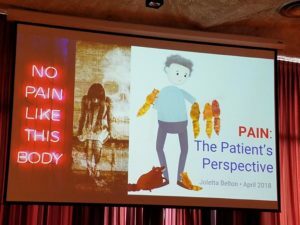 A few weeks later Joletta presented on The Patient Perspective at the Paincloud Convention in Oslo Norway to an international audience of clinicians from all over Europe and the world. She also shared the stage with pain researcher Tasha Stanton to answer questions from the audience and joined clinical researcher and psychologist Silje Endresen Reme at the end of the conference for a round of group discussions with the clinicians in attendance. In July, EPIc provided a 2 CME lecture for clinicians on pain science and patient empowerment titled Why Do I Hurt. The lecture was held at UC Health/YVMC in Steamboat Springs and was made possible by a collaboration with the Rx Task Force and the Yampa Valley Medical Park Pain Management Clinics. In September, Joletta presented a 3-hour workshop on Pain Science and Patient Empowerment at the 17th IASP World Congress on Pain in Boston. It was an incredible opportunity to share her story and have meaningful discussions with the clinicians, researchers, patients, and caregivers in attendance on how best to move forward in pain research and care. She also presented on the Innovation Lab stage following researchers Fran Toye, Karen Barker, and Kate Seers. Jo’s 10-minute story followed the findings of their Mega-Ethnography on the lived experience of pain. For more check out IASP’s Patient Engagement Initiatives. 2018 is the Global Year for Excellence in Pain Education. Joletta is a member of IASP and the Pain Education special interest group, so was proud to be at the World Congress on Pain to represent the patient voice and discuss the importance of patients, clinicians and scientists coming together to change the way we talk about, research, and treat pain. Stay tuned for more on this in the near future! In October, Joletta was a keynote speaker at the Reforming MSK Practice conference in Manchester, UK. Her talk was titled The Patient’s Take on How we Manage Pain. It was followed up by a panel with Pete Moore of Pain Toolkit fame and Adrian McGregor a former firefighter and veteran who has lived with pain, moderated by Jack Chew himself! The second day she provided the patient perspective on the Maximizing Your Sciatica Outcomes panel with Annina Schmid, associate professor at Oxford Neuroscience who researches entrapment neuropathies, and Ash James, clinical lead at IPRS Health and PhD student in occupational low back pain and resilience. There’s many exciting things to come from the #TheBigRs, follow their hashtag if you want to learn more. Joletta is also a frequent collaborator with Mark Kargela and Modern Pain Care. From being a part of patient panels for DPT students to Skyping into continuing education courses that Mark is teaching around the country, Joletta has provided the patient perspective to many clinicians and clinicians-to-be. They also just have chats with cool people! For example, Mark and Jo chatted with Ben Cormack of Cor-Kinetic in the UK and pain researcher Riikka Holopainen about her paper From Non-encounters” to autonomic agency. Conceptions of patients with low back pain about their encounters in the health care system. This is a great opportunity to hear from the lead researcher herself alongside clinical and patient perspectives. Mark and Joletta also bring the patient perspective to clinicians through Mark’s Modern Paincast. When Jo joins Mark they sit down to chat with people who are living with or have lived with pain. It is an opportunity to learn from the insights and experiences of real people who’ve lived with real pain. They chat with clinicians, too! Their last chat was with Peter O’Sullivan, where they discussed Pete’s approach through the lens of Joletta’s patient demo experience at the 2017 San Diego Pain Summit. Those are the big ones, but there is always smaller scale workshops going on as well. We’ve had meetings with other nonprofits, patient advisory councils, and practice based research networks that are leading to really interesting collaborations with primary care physicians, physical and manual therapists, and behavioral health counselors. We’re looking forward to all that is on the horizon! If you are interesting in exploring hosting or collaborating on a workshop or presentation, please email us at info@epicolorado.org or via our contact form. This post was posted in My Blog and tagged chronic pain, CME, continuing education, continuing medical education, health communication, health education, IASP, keynote speaker, medical education, montana pain conference, pain education, pain presentations, pain science, pain science education, pain workshops, paincloud, patient advocacy, patient empowerment, presentations, provider workshops, san diego pain summit, workshop. Bookmark the permalink. Acceptance revisited ~ what has acceptance meant to me? ©2019 EPIColorado. A 501(c)(3) Nonprofit Organization. All donations are tax-deductible. All Rights Reserved. Website Design by John Villarta .